Johann Sebastian Bach ƿæs organere and drēamƿrītere Europisces glengfules drēames. Geƿelgode hē his drēamas ge mid contrapuncte ('ƿiðbrorde') and mid gesƿēgre endebyrdnesse. Hƿīlum hē brēac tælsumra bysena, þǣra ðe syndriglīce of Italian and Franclande ƿǣron. Þēah Baches organan cræft hēahlīce on dæge geƿeorþod ƿæs, hē næs manigum cūþ sƿā hefig drēamƿrītere ōþ þǣm 19. gēarhundrede. Tōdæg is cūþ ƿīde þæt hē is þǣra betstena drēamƿrītera sum. Johann Sebastian Bach ƿorn gestrȳnde endleofan suna and nigon dōhtra. 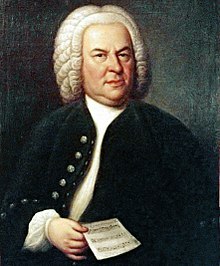 Ge Ƿilhelm Friedemann Bach, ge Carl Philipp Emanuel Bach, ge Johann Christoph Friedrich Bach, ge Johann Christian Bach ƿurdon ēac brēme drēamƿrīteras. ↑ Blanning, T. C. W. (2008). The Triumph of Music: The Rise of Composers, Musicians and Their Art. p. 272. "And of course the greatest master of harmony and counterpoint of all time was Johann Sebastian Bach, 'the Homer of music'." Man nīwanost wende þisne tramet on þǣre 14:08 tīde þæs 24 Hrēþmōnaþ 2018.